My name is Tom, and I'm a marketer. For marketing professionals, the tool set is pretty standard: Google Analytics, Adobe products, Powerpoint and now the addition of social media and other digital marketing channels. We spend our days looking at data, generating reports, creating the perfect SEO copy and looking at different ways to send out that perfect email blast. We chase translations, create videos, make sure our channels are happy and, at Geomagic, pause from time to time for epic Nerf gun battles. (Note to Tech Support: We are still #1). But who am I kidding, us marketers are also suckers for bright, sparkly, pretty things, and there's always room for more marketing tools. Enter the Keyshot add-in for Geomagic Spark. 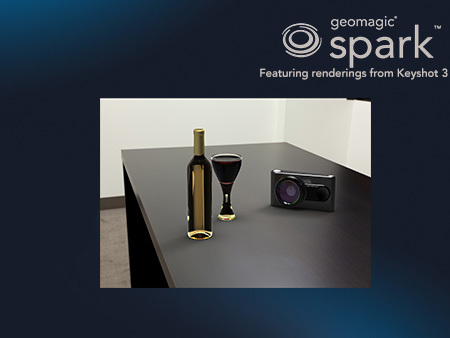 Late last year, we announced Geomagic Spark, a revolutionary scan-to-design product, which opened a whole new world to our team. Internally, the excitement for this product spread like wildfire. As beta-version after version of the product was unveiled, the enthusiasm dialed up another notch. But those of us who didn't come from a CAD or engineering background were trying to figure out how to introduce it to an audience we weren't quite familiar with. We did know that we had something truly innovative on our hands, and we were giddy to get started with it. What I didn't expect was that, with Geomagic Spark and KeyShot, I was also adding a new instrument to my marketing ensemble, a pretty instrument at that. As I mentioned, me and CAD hadn't really gotten acquainted before, but with KeyShot, that doesn't matter. Now I have something that I can use to generate beautifully rendered images from 3D content in Spark, and now I can spare product management from harassing emails like,"Thanks for that screen grab, but the angle is slightly off," or"So, I've got this STEP file " Nope, now I am independent, free to do whatever I want with relative ease and unlimited potential. Almost immediately, I started scouring our network for as many files as I could find to load in and play with. Turbines, F1 cars, vice grips and even flanges, which suddenly had a new appeal to me. Now, instead of generating a new report on referral traffic to our homepage, I was distracted with background images and metallic finishes. I was too busy placing a beautifully rendered turbine on a workshop floor to be bothered with the 50+ emails piling up in my inbox. I could bring in different components of a model and, with little effort, pull them together, create different surfaces, drop shadows, you name it. The only thing stopping me from falling into the rendering abyss was the warning signals coming from my hard drive that it was about to have a meltdown. Now, for many reading this, the initial reaction might be something like,"Congrats rookie, you found out what rendering is," and guess what, you're probably right. But with Spark and KeyShot, you can dive in right out of the gate, spend time learning, and truly enjoy the process. What was originally intended to be an add-in to an amazing new product is now part of my marketing repertoire, an unintended but much-appreciated side effect of working on launching Geomagic Spark. For me (and for industrial Spark users) gone are the days of terrible white board drawings, or lengthy emails to designers about what I'd like to see. Give me a model and a couple hours, and I'll do it myself. My name is Tom, and I'm a marketer... and a Keyshot designer. 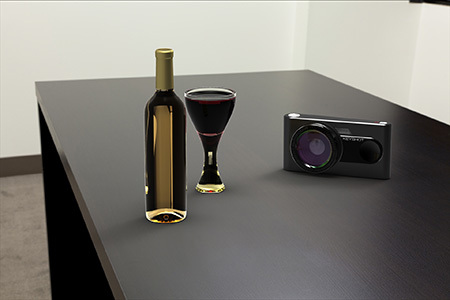 But don't forget to Visit the Geomagic Spark Image gallery to see Spark and Keyshot renderings made by actual engineers.